Ohio crime analyst Cait Pepper gets a phone call on April 1 that her Aunt Tasha has died and left her a vineyard in Northern California and 2 Shakespearean theaters. Cait’s parents died five years ago, and she’s never heard of her dad’s twin sister. Her life already in transition, Cait takes a leave of absence and flies to San Francisco and finds that her aunt’s death is slightly suspicious and that her uncle died the previous year after being thrown from his favorite horse. Everyone has a secret and acts suspiciously from time to time. Some people want her to stay permanently, others are surprised she’s still at the vineyard after two weeks. The vineyard is only window dressing here, probably more of an element in the next book, Sour Grapes, due out in October. The upcoming Shakespeare festival is a nice setting, as is the house, with an owner’s suite above an office, gift shop and reception rooms. Detective Rook is helpful, temporary stage manager and Navy Seal Royal Tanner is a possible love interest, and young secretary Marcus is sullen and rude. 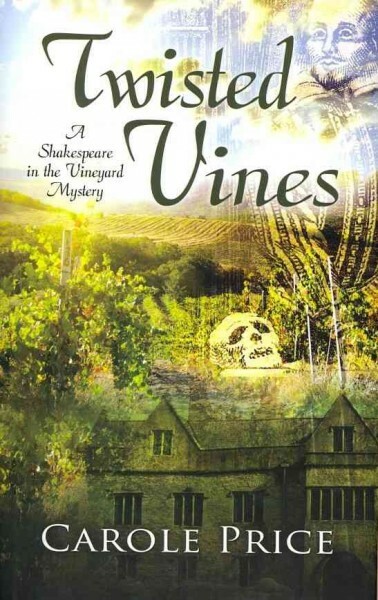 The series has some promise, but Twisted Vines has some first novel issues that better editing could have helped avoid, such as some phrases and gestures repeated more than once. Suspenseful, with a bit of romance. A good read, especially if you’re looking for a light mystery with an appealing setting.